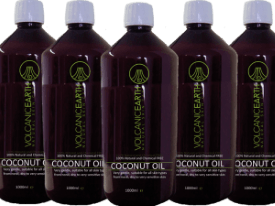 Volcanic Earth Coconut Oil is 100% pure, natural and of extreem high quality. 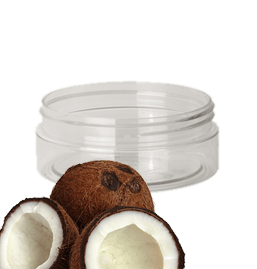 With the Direct Micro expelling method (DME) Volcanic Earth coconut oil is produced from fresh coconut meat - within 1-3 hours after the opening of the nut. Many years, Coconut oil has been bad publicity due to North American consumers' organizations and the lobby of the cooking oil industry [says the media]. Past decades shows a real turn over in terms of coconut oil and the positive effects on skin and health. Lauric acid, the major fatty acid of coconut, has long been recognized in the soap and cosmetics industry for its unique properties. That is why our handmade soap is made of pure coconut oil. Lauric acid is also recognized for its unique properties in the area of the anti-viral and anti-bacterial activity. Approximately 50 percent of the fatty acids in coconut consist of lauric acid. It is also present in breast milk and protects the body against infections diseases. We comply with the DME method. With DME coconut oil is produced from fresh coconut meat. Volcanic Earth only uses the DME Method of coconut oil production. We will explain the term DME; This is a form of "wet-milling" whereby the coconut oil is cold-pressed from the fresh meat of the coconut within 1 to 3 hours of opening the nut. The coconuts are grown biological on the fertile ground and blossom in the rich volcanic soil without any use of chemicals. During the process and after the process no artificial chemicals, additives, preservatives of any kind are used during production. The DME method is regarded by many as the highest grade of coconut oil production. The DME method of coconut oil production delivers a pure, natural and totally unrefined pure Coconut Oil. This means that it is free from impurities and retains all the natural antioxidants inside coconuts (important for slowing down the aging process). 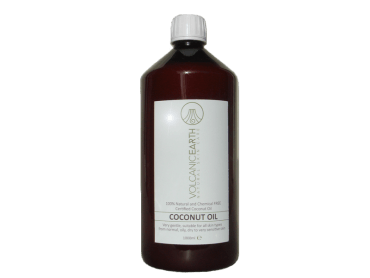 Volcanic Earth Coconut Oil is used extensively throughout our skin care ranges and this even extends to our hand-made Coconut Oil Soaps. There is nothing as essential to healthy skin as a great, chemical-free soap and yet most coconut oil soaps are made from second-rate copra oil - not so at Volcanic Earth! Coconut oil is traditionally used in many different foods, because the oil is stable and adapts well. This also makes it a perfect oil for the industry. Coconut oil, for example, does not need to be cooled and remains hard at room temperature. Unopened, they can be kept for three years with no loss of quality - after opening even 18 months. The main issue with coconut Oil for the skin is to make sure that you use the right type of coconut oil as most of the coconut oil on the marketplace is low quality copra oil with little health benefits for the skin or the human body in general. You will not notice in on short term. Just be aware when it comes to sourcing coconut oil for your skin or as a hair conditioning agent. The best coconut Oil for the skin is proper Virgin Coconut Oil cold pressed within a few hours of cracking the coconuts. Our Virgin Coconut Oil achieves this through the DME Method of coconut oil production. DME stands for Direct Micro Expelling and our oil is handmade, natural, raw and produced within 1 to 3 hours of opening the nut. Consequently, it retains the distinct fragrance of coconuts, whereas the copra-based refined coconut oils have no taste or fragrance at all due to the refining process. In fact, coconut oil made this way will often have the "fragrance" added artificially! Our Extra Virgin Coconut Oil is not only naturally organic, it is also unhydrogenated, high in antioxidants (which fight free radicals that cause us to age faster) and free from impurities. For Spa and Wellness we also offer Coconut Oil with the effective frangipani oil. For exclusive products, ask for possibilities in your Spa, Wellness or Salon. We all know Coconut Oil is good for skin and hair. Due to the variety in brands we do not know which one is good for you ?